Consciousness has many elements, from sensory experiences such as vision, audition, and bodily sensation, to nonsensory aspects such as volition, emotion, memory, and thought. The apparent unity of these elements is striking; all are presented to us as experiences of a single subject, and all seem to be contained within a unified field of experience. But this apparent unity raises many questions. How do diverse systems in the brain co-operate to produce a unifiedexperience? 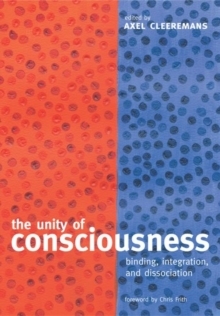 Are there conditions under which this unity breaks down? Is conscious experience really unified at all?In recent years, these questions have been addressed by researchers in many fields, including, neurophysiologists and computational modellers, neuropsychology, cognitive psychology, and philosophy. With chapters from some of the leading thinkers on consciousness, this is a thought-provoking book that attempts to answer some of the big questions. Contributors include - Chris Frith, David Chalmers, Guilio Tononi, Anne Treisman, Andrew Young, Sydney Shoemaker, Glyn Humphreys, Rodney Cotterill, Zoltan Dienes, Susan Hurley, Randall O'Reilly, Andreas Engel, Pierre Perruchet, Catherine Tallon-Baudry, and Francisco Varela.